Pomoca’s BiColor Wax is the Neapolitan ice cream and Swiss army knife of the climbing skin world. Each flavor has its own color-coded personality and is ready to give you a leg up on the competition no matter the conditions. Use the included scraper to clear any excess moisture from the material, choose your wax, apply, and away you go! 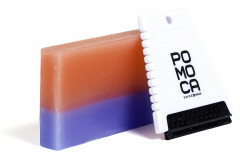 Make glopping a thing of the past with Pomoca’s BiColor Wax. The included ice scraper is not intended for your car window, unfortunately. Glomming is a serious issue when chasing mountaineering objectives, moving from wet snow at low elevations to dry higher up is a perfect recipe for glopping. If not remedied it can shut down big objectives. This stuff works great, toss it in a pocket of your touring pack and forget about it until you need it. Not sure if the two colors are entirely necessary, haven't noticed a difference between the two. Took off a star because while this works well, a little cube of ski wax does the job too at a much cheaper price.